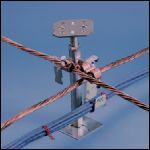 The Universal Pedestal Clamp, part of the ERITECH® line from ERICO, allows for fast, simple and economical field construction of mesh bonding network (MBN), such as supplementary bonding grids, and cable management systems in data centers and computer rooms. In addition to multiple cross-wire bonding connections, each connector will also accommodate pigtails that can be used to connect to building steel and equipment. The Universal Pedestal Clamp allows for fast, simple and economical field construction of mesh bonding network (MBN) and cable management systems in data centers and computer rooms.